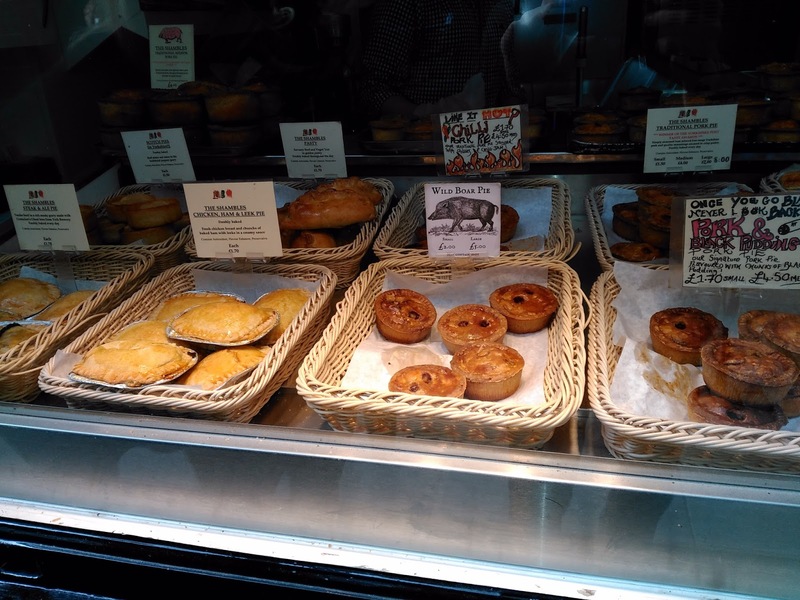 On a recent visit to the Viking city of York I was pleased to find a proper, traditional pie shop in the heart of the city. The narrow street called The Shambles is rich in history. Some of the timber framed buildings date back to the 14th century. It is also rich in pie history with the street having previously been packed with butcher's shops. There is a high kerb running down the street. I heard was so the blood and gore could flow away down the centre of the street.... a bit different to your modern supermarket meat aisle! The street is now primarily focused on tourists with gift shops and quaint cafes. Fortunately one shop is tapping into the street's heritage, they don't even have a sign, just a picture of a pie hanging from the side of the shop. Ye Olde Pie & Sausage Shoppe has a lovely display of pies sitting proudly in the window. They also had some interesting flavours so I couldn't restrict myself to only trying one. Many of them were in the style of a pork pie and could be eaten cold but they also had pies that they could heat up for you to eat straight away. 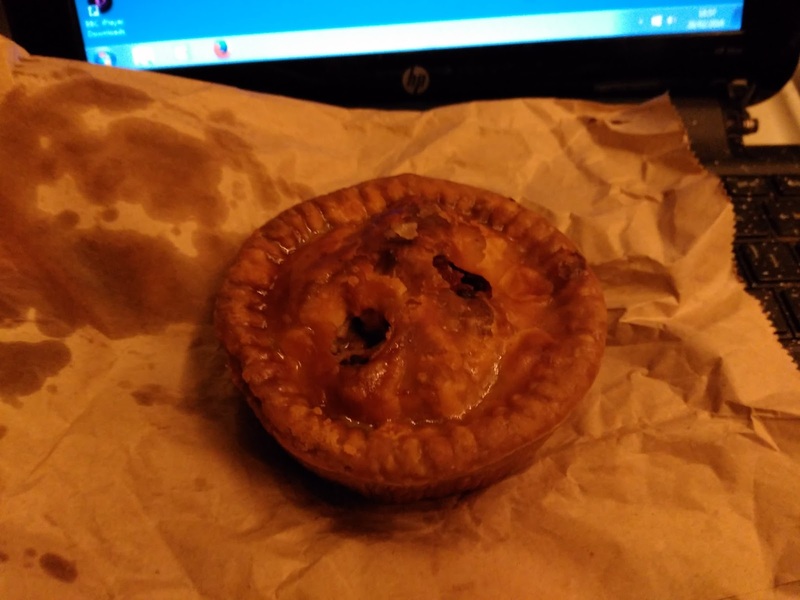 I grabbed a Scotch Pie to have hot for £1.50 then to have later I got a Pork & Black Pudding and a Wild Boar pie at £1.70 and £2.00 respectively. Some of the pies they had made themselves and some of them were brought in. This really showed as I have never had such a mixed experience from one shop. The pork and black pudding pies and the wild boar were both clearly premium, hand-made products in excellent Condition. As you can see from the picture, the rustic appearance fit in perfectly in the Viking banquet reconstructed in the Yorkshire Museum (which was well worth a visit by the way). They had ample golden glaze giving a delicious Colour. Something I always look for in a good pork pie is a bit of a crunch to the pastry unlike the soggy fare from mass produced pies. This pie did not disappoint being incredibly crunchy. This must have been made for strong Viking jaws. At one point I wondered if I had accidentally picked up one of the fake loaves of bread from the banqueting table. The Content certainly a bit different to your average pork pie. Instead of jelly the pie relied on the black pudding to give keep it moist. It had quiet a pungent aroma which reminded me of charcuterie and was slightly over powering. 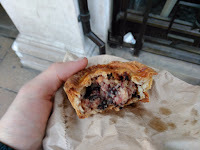 I did enjoy the black pudding which added a bit of variety which is normally lacking for a pork pie. It was let down by some of the pig meat being a bit Chewy. It had a decent sized capacity and for a premium product at a premium location, £1.70 seemed relatively Cheap. 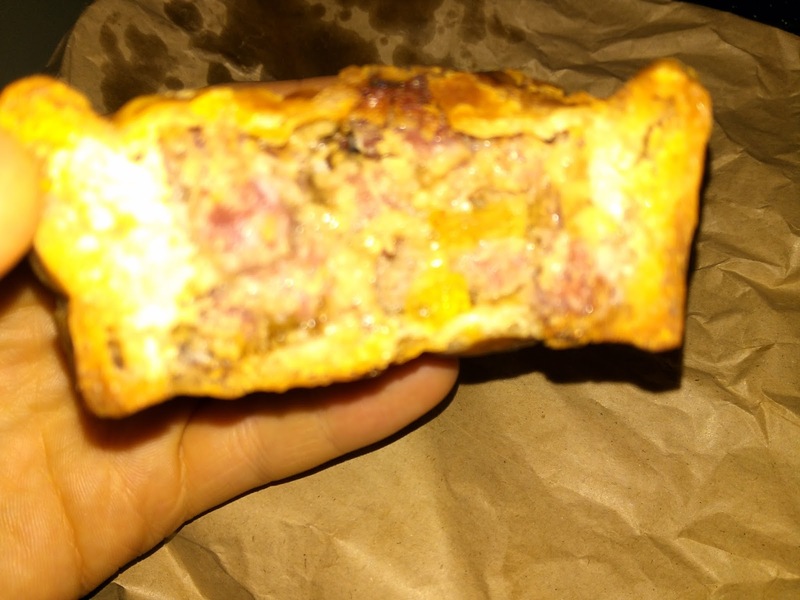 The Wild Boar pie looked like it had the same pastry that the Pork & Black Pudding but if anything it was even more crunchy! The pastry actually squeaked against my teeth in a very peculiar way and bordered on being a bit dry. It was a bit softer on the inside and somehow it just about worked. This pie was helped by having an excellent Content. The wild boar was cured in big, salty pink chunks that tasted a bit like gammon. The pieces of meat were firm which gave plenty to get your teeth into. There was a lot of jelly in all the gaps which kept it moist and held the fragmented filling together like a delicious glue. As you can see from the photo, it was very greasy, turning the bag translucent, like all good pork pies should! 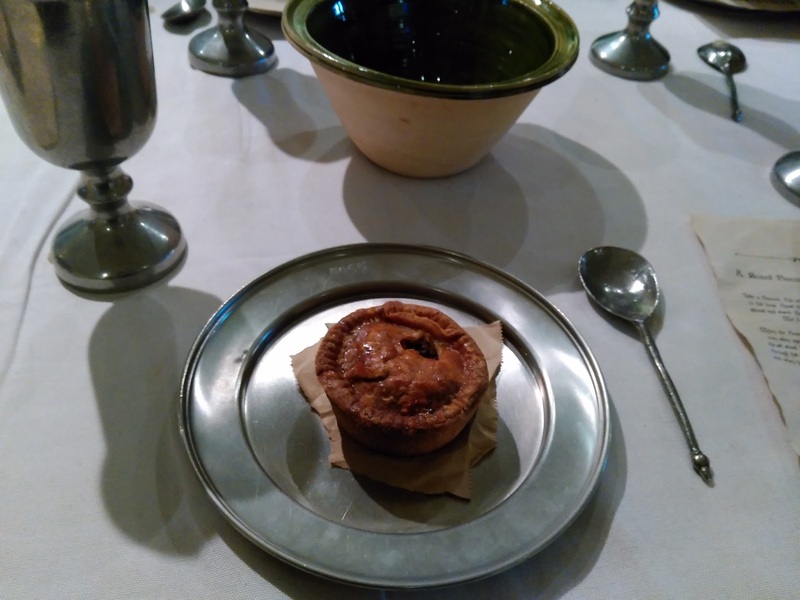 It was a bit different to your average pork pie but overall the unique Consistency worked. Another Pierate Recommended Wild Boar pie to add to a surprisingly long list. Last and definitely least was the Scotch pie. It was by far the worst Scotch pie I have ever had. 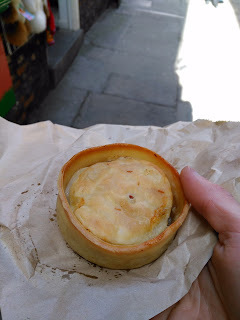 You may be aware that I am quite a fan of Scotch pies, having reviewed a fair few in my search for what makes the best Scotch pie. It is relatively rare to find one in England so I thought I had to go for it but soon regretted it. There was nothing too it really. I bit into it and the lid sunk down to the base because there was barely any filling. The pastry was too dry and not enjoyable to eat. Whilst the filling was very moist, there just wasn't enough of it to soften the pastry. The filling wasn't unpleasant to eat but seemed quite watery and runny. I think it was probably beef but it was hard to say for sure. I couldn't really find anything good to say about this pie so it unfortunately goes to the bottom of our Scotch pie rankings. The only saving grace for Ye Olde Pie & Sausage Shoppe is that they didn't actually make this one, having bought it in from catering giants Bako. 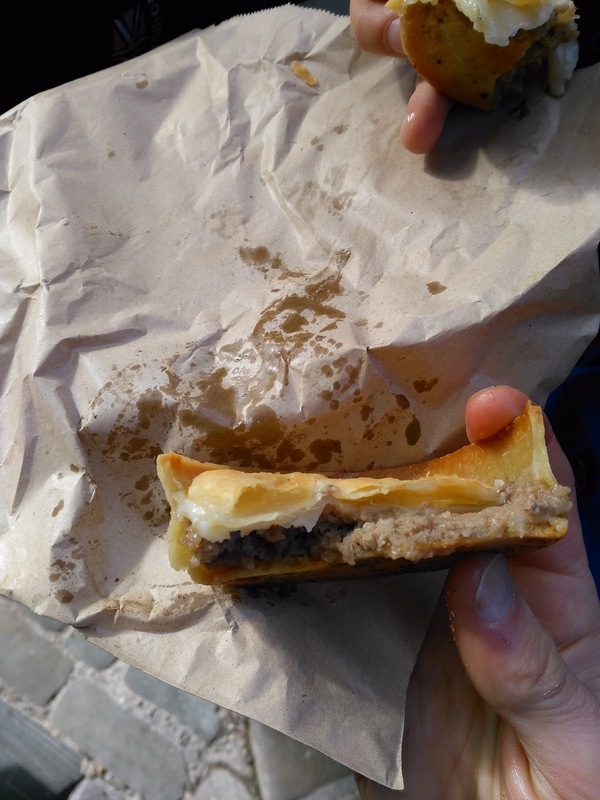 The Scotch pie was one blip on an otherwise very enjoyable trip to York. It is a fine city with lots of interesting history, particularly Roman and Viking. Sadly the Jorvick viking museum was closed due to the terrible flooding they experienced in 2015. Due to reopen in 2017, they are trying to meet some of the cost via crowd funding, I might have to pay another visit when they reopen but will know to avoid the Scotch pie next time. continue reading "York Pies - Shambles"
The Pies Graffiti: BBC prove what the Pierateers knew all along! 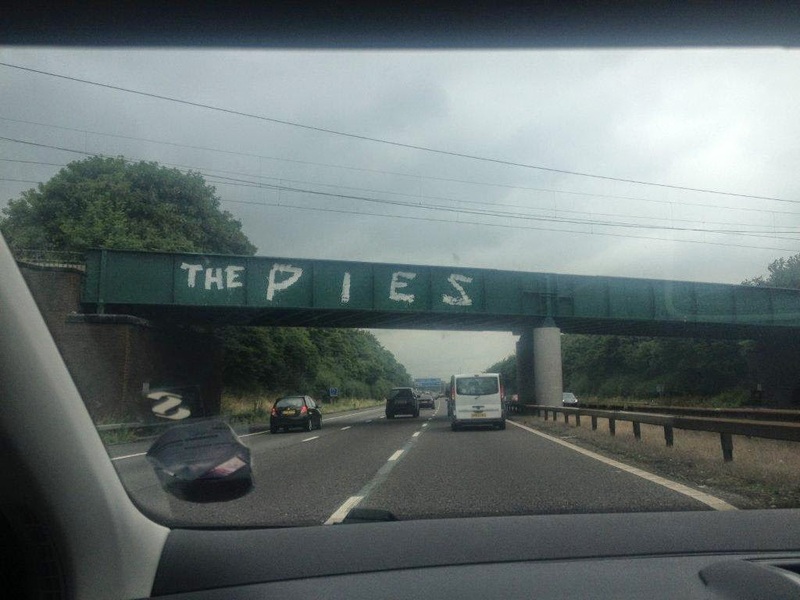 Two years ago, following a number of photos like the one below doing the rounds on twitter, the Pierateers felt they needed to clarify that they were NOT behind the "The Pies" bit of graffiti on a road bridge near Chester. Pierate officially confirmed we were not doing a Banksy and adding pie signage to road bridges up and down the country. If we'd been thinking of doing such a thing, we would certainly have put either "Pierate" or "We rate all the Pies" - our policy summed up brilliantly in our article "Who rate all the Pies?" which was produced just prior to British Pie Week two years ago. Once again, the Pierateers prove they are one step ahead of the game when it comes to all things pie! 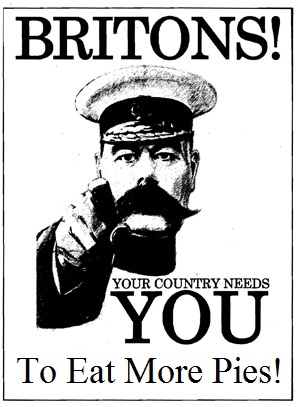 continue reading "The Pies Graffiti: BBC prove what the Pierateers knew all along!" MyPie's Chris honoured as Pierate hits 500,000 views! At times like this, when you sit back and actually reflect on the pie-oneering work that we have done, as writers of the world's leading pie review blog, it can sometimes blow you away! Never in a million years would we have thought back in November 2009, when www.pierate.co.uk turned from a "funny idea" into a registered domain, that today we would be celebrating 500,000 page views! I'll pause there and say it again - HALF A MILLION page views... to a website that pretty much only talks about pies!!! But that is exactly what has happened! And it's only due to the loyal support of friends and family and the wider community of pie fanatics out there across the world! While most of our views have been from the UK and USA, there have been views from all over the world, including Australia, China, Canada and much of mainland Europe! Pies really are a world cuisine! We've had a number of catch ups with Chris over the years, including trying his Beef and Red wine pie in March 2014 prior to his purchase of the pie truck that he's since been touring London and part of the UK in. And alongside a number of visits to the pie truck ourselves, we were also honoured to have Chris come up to Birmingham to provide the pies for our 6th Birthday Pie-rty! Chris is certainly deserving of our award of being an Honorary Pierateer! Click here to view all the MyPie pies we have reviewed. 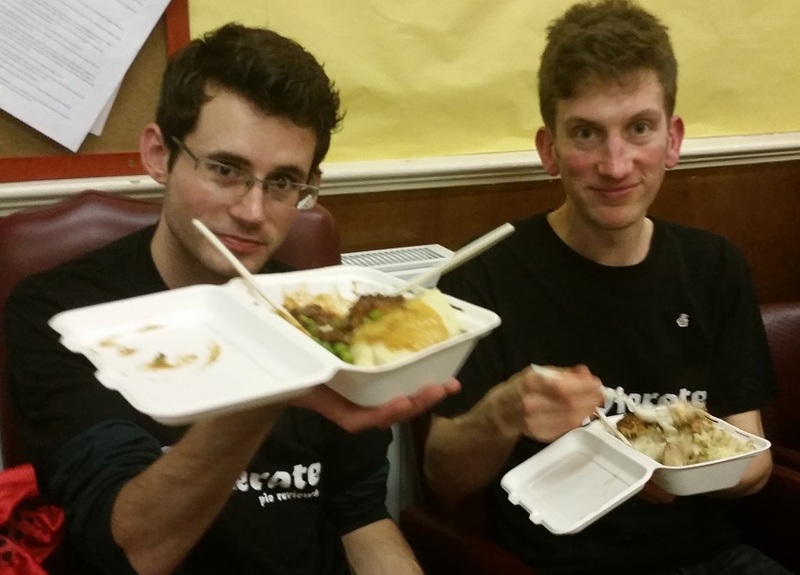 Tim and Sam enjoying MyPie at our 6th Birthday Pie-rty! It seems crazy to think that on the 19th October 2013 we were celebrating yet another impressive milestone being reached - that of us having had 50,000 pageviews! Less than three years on, we've had 10 times that number, and are delighted so many pie fans have been able to enjoy and benefit from our pie research! Our slogan has always been "We rate all the pies so you don't have to" and 500,000 page views down the line, it appears many of you enjoy our musings aboard the Pierate Ship and on twitter @pierateers! So... here's to one million pie views!!! Note: We want to once again say a big thank you to Chris for coming all the way up to Birmingham last November to provide the pies for our 6th Birthday Pie-rty! The pies were so awesome, as you'd expect from Top 10 pies in our rankings, and Chris was brilliant. And the exciting thing is there are new pies on his menu, so we look forward to seeing him again soon. Click here to view all the MyPie pies we have reviewed. continue reading "MyPie's Chris honoured as Pierate hits 500,000 views!" - A unique homemade birthday cake pie by the Ship's Cook - we are very intrigued about this!!! - A Steak pie from King's Farm, our current number 2 rated pie in our pie rankings of over 500 pies! 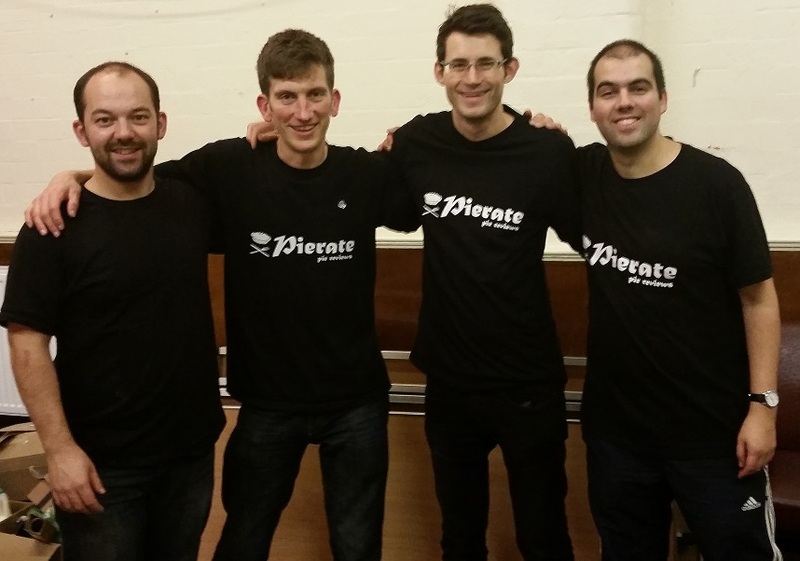 On top of all this we look forward to catching up and will have a bit of a reflection on the year gone in our Pierate AGM! No doubt there will be tweets and a follow up post once all this pie is eaten next Saturday! In the meantime, why not find out more about all the Pierateers by checking out our About Us page?! continue reading "One week til #PierateFest2016"